Aretha Franklin turns 70: Celebrate with her greatest hits! Aretha Franklin turned 70 years young over the weekend! It’s hard to believe that the Queen of Soul isn’t 170 years old — after all, she’s battled through adversity (and cancer) to produce some of the biggest musical hits ever. 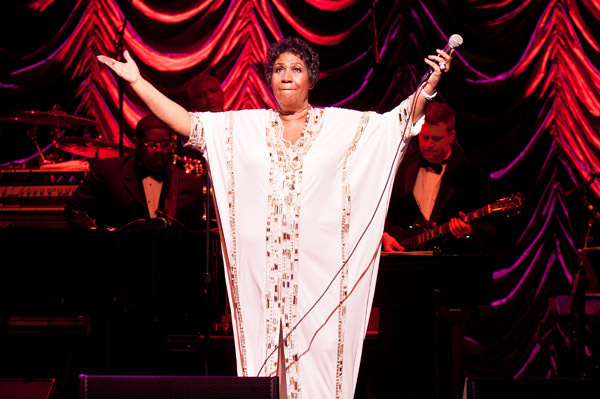 Check out our favorite Aretha Franklin songs. Aretha Franklin celebrated her 70th birthday over the weekend with a party fit for a queen — a Queen of Soul, that is. The legendary R&B voice rang in 70 years on Sunday, but her party on Saturday was all about celebrating the future. The biggest revelation? Franklin has re-signed with legendary music producer Clive Davis to record a new album. It’s been a rough couple of years for Franklin — she won a rumored battle against cancer, got engaged (and un-engaged) and mourned the death of her goddaughter, Whitney Houston. She also managed to drop 85 pounds from her once-heavy frame. “I’ve been looking at a lot of pictures, and I was saying [to myself], ‘You were entirely too fat for words,'” she told Wendy Williams in 2011. Some doctors speculated that she lost weight through bariatric surgery, but Franklin stayed mum on the rumors. Now? Everything is coming up roses for Franklin — and her sense of humor is still intact, thank you very much. “I was wondering, ‘What is it going to be like to be 50?’ I can tell you now it feels like 40,” she joked to the crowd. Thinking of Franklin’s career got us on a soul music kick — and we can’t believe how many of her songs were incredible hits. Check out our favorite picks. This ode to a man who knows just how to treat a woman was one of Franklin’s first hits in the late 1960s. We think it’s still quite relevant today, don’t you? Who doesn’t want a little R-E-S-P-E-C-T? Franklin showed women that it’s perfectly fine to demand equal treatment from their men. Also, try to listen to it and not break out into a sassy dance, we dare you. Franklin has a way of permanently embedding lyrics into our heads with her style of singing. Take for example “Chain of Fools” — we’ve know that song by heart since we were youngsters. Dionne Warwick was the first singer to put out this song, but Franklin made it into her own hit with her 1968 remake. Katy Perry wants to do an iconic song with BFF Rihanna that mirrors the song Franklin and Annie Lennox did back in the ’80s. We’re not sure they can compete, but it’s nice to have a goal. What is your favorite Aretha Franklin song?